The Noyes Descendants, Vol. II says 17 Apr 1729. (In the Name of God amen, this twenty ninth day of November in the year of our Lord one thousand seven hundred ninety & nine. I, Thomas Noyes of Newbury in the County of Essex and Commonwealth of Massachusetts Gentleman being advanced in age and esteeming it my douty, do make and ordain this my last Will and Testament. Principally and first of all I humbly commend my soul into the hand of God who gave it and my Body I commit to the Earth to be buried in decent Christian Burial at the discretion of my Executor and as touching such worldly Goods or Estate as God in his Providence have blest me with I give, devise and dispose of in the following manner and form, viz. Imprs. I give and bequeath unto my well beloved wife Sarah all the household Goods and things she brought to my house on marriage and all the right Title and Interest I have in any thing that was hers before marriage, and the one half of the provisions that shall be in my house at my decease to be at her dispose for ever; I also give her the use and Improvement so long as she remains my widow, the one half of my now dwelling house and one Cow kept for her and the use of a horse to go to meeting and elsewhere as she shall have occasion for and wood sufficient to keep one fire and the use of Mr. Henry’s six Volumes on the Bible, I also give her in Case she acquits to my Executor her Right of dower in my real Estate the sum of two hundred dollars to be paid her by my Executor upon her acquittance. Item I give and bequeath unto Samuel Noyes eldest son of my Brother my silver hilted sword. Item I give and bequeath unto John Moody the only son of Susanna Moody twenty five dollars to be paid by my Executor at my decease. Item I give and bequeath unto Thomas Noyes Chase the son of Moses Chase of Plastow fifty dollars to be paid him by my Executor when he shall arrive to age of eighteen years, then his recept shall discharge my Executor. I give and bequeath unto Bettey Noyes youngest daughter of my Brother fifty dollars to be paid her by my Executor at my decease. Item I give and bequeath unto Stephen Noyes Morse, son of Richard Morse of Pembrook my great Bible and five dollars in money that shall be paid him by my Executor that his receipt shall discharge my Executor. Item I give and bequeath unto Stephen Noyes youngest son of my brother Noyes and to his heirs and assigns all the Rest of my Estate not before disposed of in this my Will of what Name or Nature soever I shall die seiz’d of or that shall come by virtue of me, he paying the money ordered in this my Will, my just debts and funeral Charges, him the said Stephen Noyes youngest son of my Brother Noyes I hereby constitute and appoint the sole Executor of this my Will, and I do hereby utterly renounce and revoke all other Wills or Executors by me made or named, ratifying and confirming this and no other to be my last Will & Testament. In witness whereof, I have hereunto set my hand and seal the year & day before specified. Commanded a company of Minute Men which marched to Cambridge, April 20, 1775. He also served in other commands during the Revolution. His estate inventoried £4989. He willed his silver-hilted sword to Samuel, eldest son of his brother Stephen. The Noyes Descendants, Vol. II says 1798. [S1892] Book-Mass. Soldiers & Sailors in the War of the Revolution, Vol. 11 Page 557. [S244] Book-VR Newbury, MA; Vol. I - Births, 2:369. [S400] Book-Descendants of John and Anthony Emery, CS71.E535., p.17. [S89] Death-probate of will, File date 7 Dec 1801, transcribed from microfilm of Essex County probate copybooks at Massachusetts Archives, Volume 369, pages 7-8 (volume and pages as numbered by the Archives). Transcribed by Ruy Cardoso ruygenealogy@yahoo.com and posted on MAESSEX 5 Jun 2006. 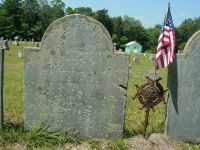 [S86] Death-gravestone, Bridge Street Cemetery, West Newbury. [S1890] CD-Mary Adams Rolfe Papers, Disk #1 Emery. [S142] Book-Vital Records from Maine Newspapers, 2:437. [S913] Newspaper-Gazette, Vol: 1; Iss: 36; Page: 3 12/31/1798. [S2582] Book-Aquilla Chase and His Descendants, p.96.